No instructions needed, and no right or wrong answers. These crescent-shaped blocks have strong internal magnets that allow them to stack and combine at all sorts of angles. The curving exterior is a refreshing alternative to regular cubes and bricks, and the resulting structures will have the option to bend and curve, or remain rigid and straight. Once one block gets close to another one, the powerful magnets will snap together with a click, and hold strong to remain attached. Children of any age will find that building with this toy is simple, fun and effortless. Once connected, the curved sides can slide into different positions without detaching from the other blocks. Children can quickly stack and create, and then once complete, they'll be able to morph their tower into something completely different. Each block is brightly colored, and the see-through material allows kids to see inside. The internal magnet can move to any position, so the options for construction are nearly endless. They are ideal for use on any flat surface, but the two included base pieces make other surfaces viable too. Balance and attract to create mind bending structures with ease. For ages 3 and up. 26 pieces. Each moon-shaped block has two high quality magnets stuck inside. One is fixed at the center of the inside arch. The other slides along the outside arch, and can move to any point along the outer edge. When the inner magnet of one block comes close to the moving magnet on another block, the two pieces will instantly snap together. Once stuck, the bond is pretty strong, so blocks remain securely connected without effort. After attaching one to another, you'll still be able to slide and re-position them, as they hold together. Children can easily stack, pile and combine to make all sorts of structures that bend and sway, or ones that remain rigid and straight. Thanks to the see-through exterior, they'll also be able to look inside to know how they work. Effortless Construction. Incredible magnetism, and large shapes make these blocks easy to play with. Children of any age will enjoy the frustration free building experience as each piece practically attaches itself to the other ones. Vibrant Colors. Kids love colors, and the bold palet this toy draws from is sure to please. Eye popping reds and blues combine with bold oranges and greens to keep kids captivated. Strong Magnets. Similar toys use lesser innards to save on costs. This also results in way less fun because pieces fall, and kids lose interest. Top quality components have been used here, so strong bonds are guaranteed. Translucent Exterior. There's allot going on in there, and children can easily discover the secret behind these blocks by looking inside. They can see the magnets moving, and understand that once lined up, the blocks connect. Build Anywhere. They work really well on any flat surface, but this set also includes two base pieces that will help kids use them anywhere else they want as well. 24 Pieces. Plenty of blocks are included in this complete set. When using all of them together, large and intricate designs can be constructed. High Quality. Flimsy plastic and other cheap materials are for other toys. This one features sturdy construction, and top quality plastics, so it will last for years without damage or wear. Impossible Angles. Each perfectly balanced piece can connect at a multitude of angles, so structures can erect straight up and down, or they can curve and bend through space at seemingly impossible angles. Teach kids about balance, geometry and magnetism, and let them have fun at the same time. The unusual shape and clever attachment method allows children to build in ways that defy rational thinking. Allow them to push the limits as they explore what is possible. The precise shapes and odd angles work together in a way that will encourage creative thought. Attach the magnetic base to a vertical surface to really test the boundaries. Structures can stick out horizontally in space, and then curve upward as if they are weightless. Once your child begins to explore with Arx 2.0, they will have an endless amount of fun and enhance brain function at the same time. Package Dimensions 9.75" x 8.5" x 2"
Block Dimensions 2.15" x .75"
Base Piece Dimensions 3.2" x .75"
Color Multiple. Each block is a solid color. Colors included are: Red, blue, green and orange. Uses Stack, build, slide, rock, balance and more. 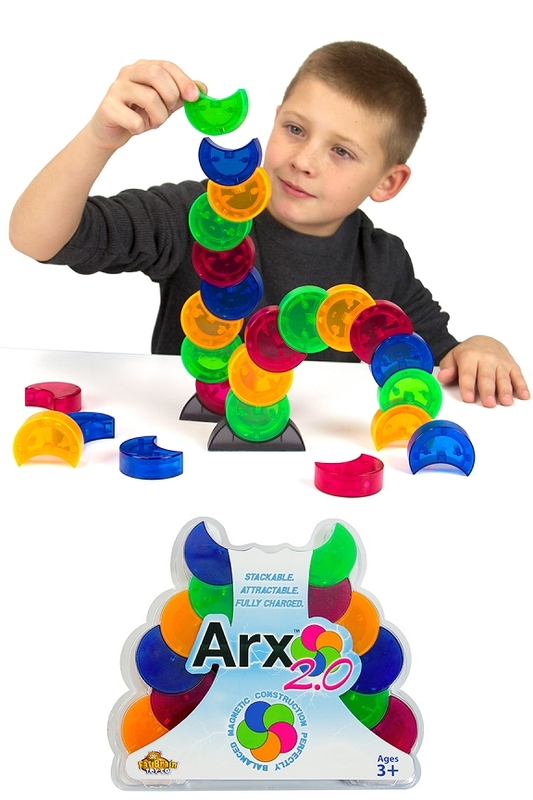 A versatile stacking toy with internal magnets. Magnetic Yes. Powerful rare earth magnets lock pieces together securely. Number of Magnets 2. 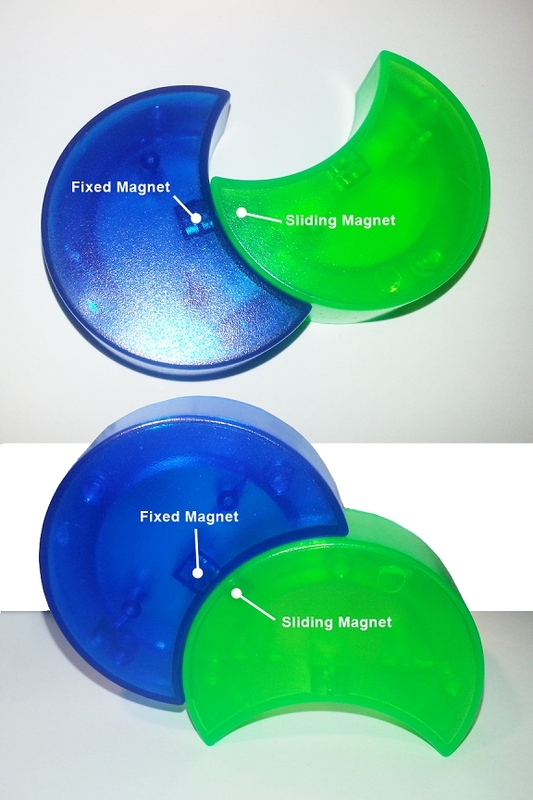 Each piece has one fixed magnet, and one that slides. Translucent Yes. Children can look inside to see how they work. Bright colors, fun shapes and powerful magnets combine to create a truly captivating toy. Stack, construct, swing, slide and pile. Each piece connects to others at multiple angles for hours of fun. Order Yours Today! The product performs exactly as I had hoped. The magnetic blocks join easily and are interesting for children from about 3 years upward. A metal fidget toy with moving steel balls at the tip of each arm.